Super easy duets for students who have just learned a few notes. From duets in open strings to a gradual use of fingers in the later duets, these are fabulous teaching material by the great Sheila Nelson that I've used many many times. look inside Right from the Start (for 2 Cellos). Composed by Sheila Nelson. For Cello Duet. Boosey & Hawkes Chamber Music. 10 pages. Boosey & Hawkes #M060039324. Published by Boosey & Hawkes (HL.48010218). Good beginning duet book that can work along with String Builder Book One. look inside Duets for Strings, Book 1 (Cello). Composed by Samuel Applebaum. Orchestra. For Cello. Duet or Duo; String Orchestra Method/Supplement. Belwin Course for Strings. Book. 16 pages. Published by Belwin Music (AP.EL01992). 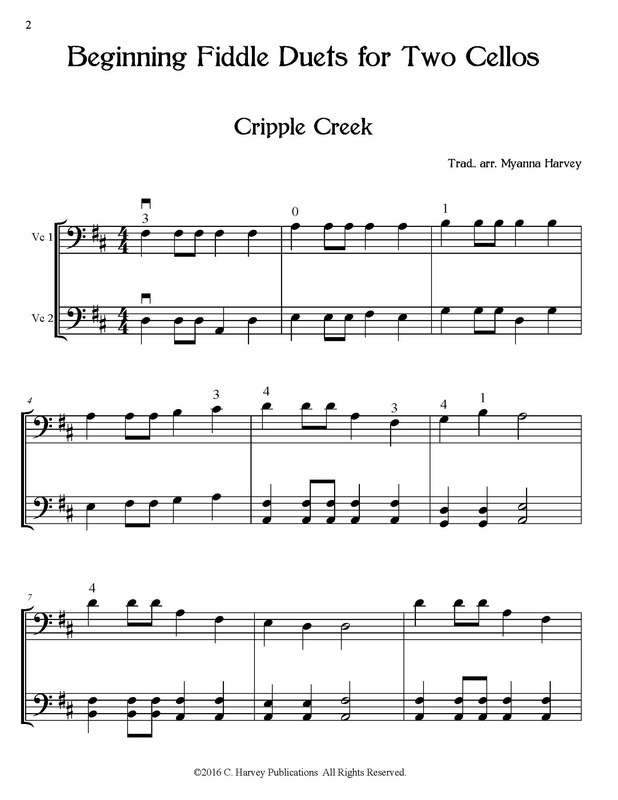 Fun, easy beginning fiddle duets for cello. The top part is entirely in closed first position, while the bottom part is in both closed and extended first position. Cute Tunes for Cello Duet! Just a few of these have some slightly challenging techniques. Most of the duets are enjoyable and playable! look inside Tunes You Know 1 - Book 1 (Easy Favorites for Cello Duet). Composed by Sheila Nelson. For Cello Duet, Cello. Boosey & Hawkes Chamber Music. 15 pages. Boosey & Hawkes #M060085765. Published by Boosey & Hawkes (HL.48011247). look inside Tunes You Know 2 - Book 2 Easy Favorites for Cello Duet. Composed by Sheila Nelson. Boosey & Hawkes Chamber Music. Educational, Classical. 16 pages. Boosey & Hawkes #M060085772. Published by Boosey & Hawkes (HL.48011248). This book starts out wonderfully but adds considerable extended first position pretty early on. look inside Easy Violoncello Duets, Volume 1 - 1st Position Edited by Josef Rentmeister. For 2 cellos. Instructional. Easy cello duet book (no accompaniment). Duet notation. 16 pages. Heinrichshofen Verlag #N4101. Published by Heinrichshofen Verlag (PE.N04101). Again, this book contains more extended position than I usually teach at the very beginning. I would call this "22 Pretty Easy Duets". look inside 22 Very Easy Duets, Opus 126 Composed by Sebastian Lee (1805-1887). For 2 cellos. Published by International Music Company (IM.2865). These two books by Samuel Applebaum contain a wealth of beginning cello duos. look inside Chamber Music for Two String Instruments, Book 1 (2 Cellos). Composed by Samuel Applebaum. For 2 Cellos. Duet or Duo; String Orchestra Method/Supplement. Book. 16 pages. Published by Alfred Music (AP.EL02329). look inside Beautiful Music for Two String Instruments, Book 1 (2 Cellos). Composed by Samuel Applebaum. For 2 Cellos. Duet or Duo; String Orchestra Method/Supplement. Book. 32 pages. Published by Alfred Music (AP.EL02201). This is a rhythm-intensive book that works really well! I love the old duos that really push my students to better counting. look inside Violoncello Duos for Beginners - Volume 1 Composed by Arpad Pejtsik. Arranged by Arpad Pejtsik. For Cello Duet. EMB. 47 pages. Editio Musica Budapest #Z8158. Published by Editio Musica Budapest (HL.50510927). Just tons and tons of material here. look inside Easy Duets and Solos - Vol. 1 (Cello). Composed by Erich Doflein. For Cello, Cello Duet. Schott. Playing score. 32 pages. Schott Music #ED6643. Published by Schott Music (HL.49006507). Adorable duets that kids usually love. Wish the notes were bigger. look inside Stringsongs (Pupil's Book). Composed by Sheila Nelson. For Cello (Cello). Boosey & Hawkes Chamber Music. 24 pages. Boosey & Hawkes #M060039331. Published by Boosey & Hawkes (HL.48010219). Great for older beginners who crave a bit more complexity in their duos (this is definitely not a Samuel Applebaum book!). look inside Leichte Stucke, Band 1 (Easy Piece, Vol. 1). Composed by Jean Baptiste Sebastien Breval (1753-1823). For Cello. Schott. Playing score. 16 pages. Schott Music #ED6158. Published by Schott Music (HL.49006051). Repertoire and advice for cello teachers.